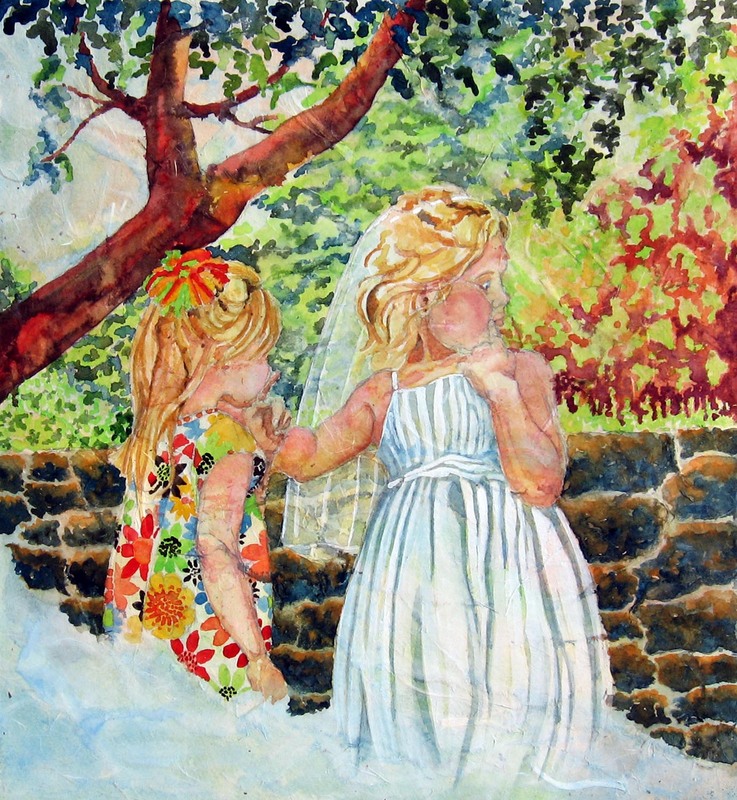 I created the above paintings from photo references that my sister took of my Granddaughters while they played hide and seek after my daughter’s wedding. Thank you to my sister for allowing me to paint from them. I love the technique I used to create them so will share how I created the top one with you. 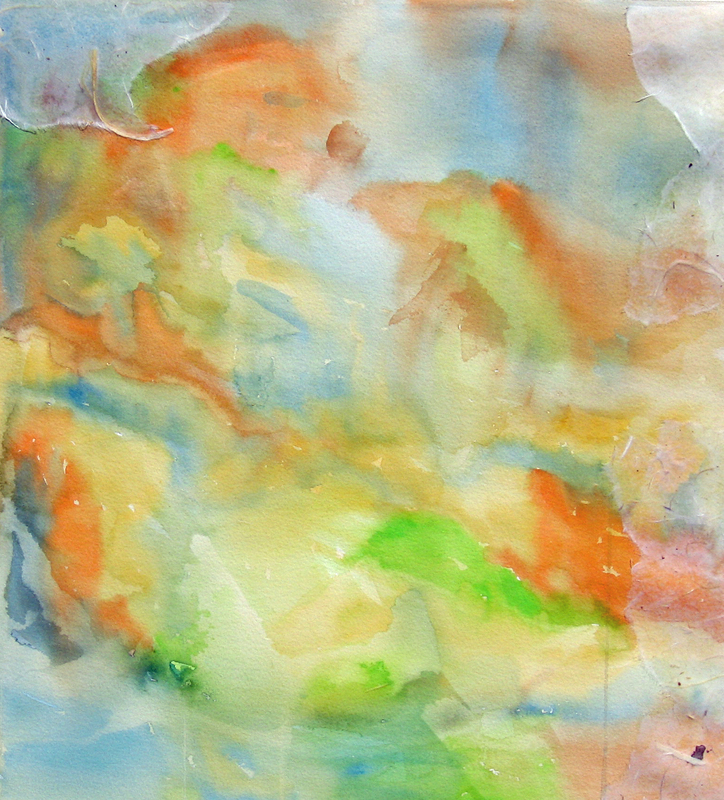 In the first step, I toned a piece of 140lb Arches coldpress with abstract color. I had to get this layer dark enough so it would show through the rice paper I was going to glue on top of it. I then covered the entire surface with torn pieces of textured and transparent rice papers, overlapping them as I went. I mixed my glue with 1 part water to 3 parts acrylic matte medium. This created numerous textures over the surface of my abstract. I applied the glue on the underside of the papers and thinly over the top side of them with my brush, making sure I pushed any air bubbles from under the papers. I allowed this stage to dry overnight. I then drew my subject on the format in graphite. Yes. You can erase, easily, on this surface. I really enjoyed this surface. It was much like when I paint on toned Masa Paper pieces. I found I could lift and blend color if it dried too flat looking. 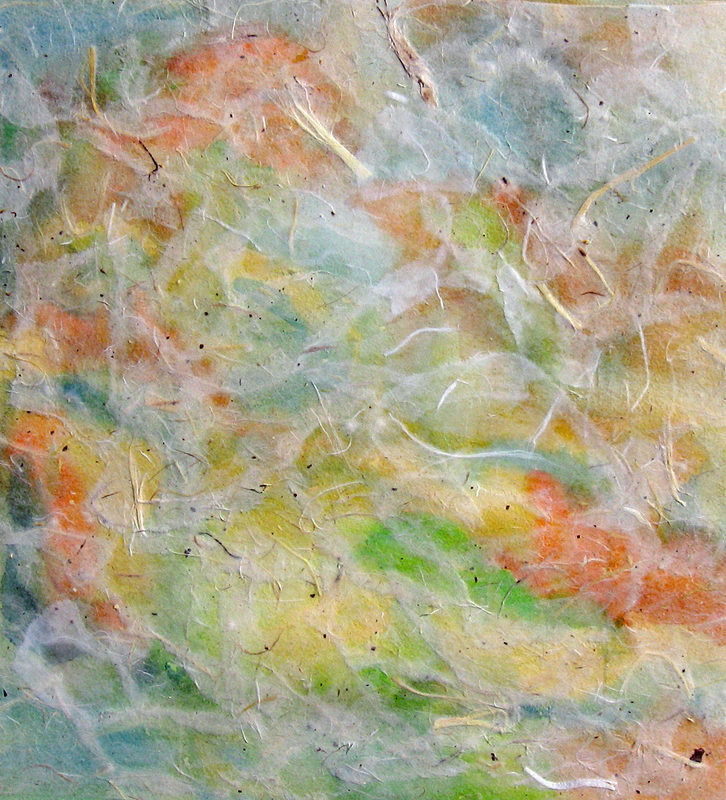 Some of the pigment would trail along a torn piece of the rice paper and add more texture. Sometimes when I rubbed my brush over a dried painted area, interesting textures would show through like in the lower right hand quadrant of the second little girl, above. 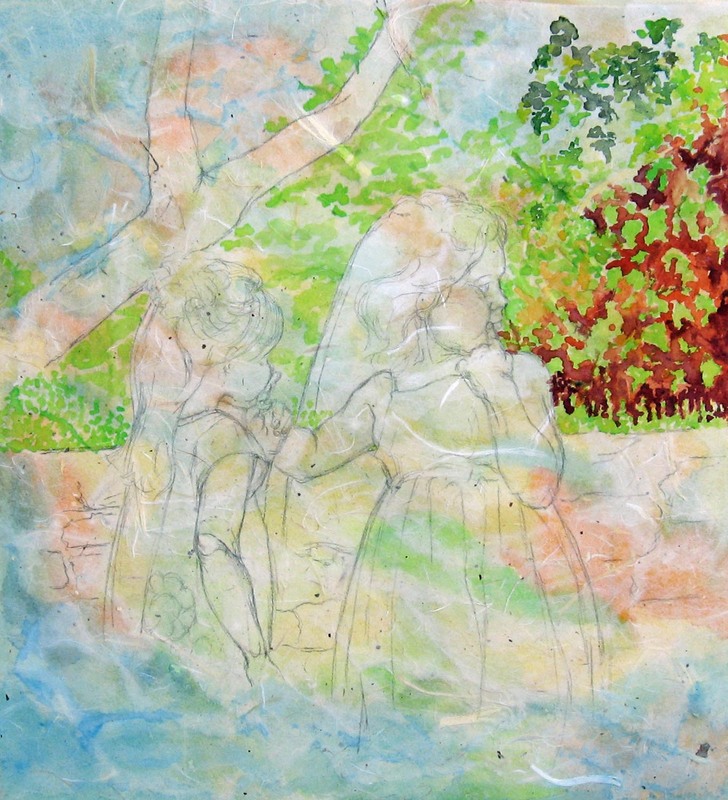 The glow of the original underpainting showed through in some areas, adding to the piece. 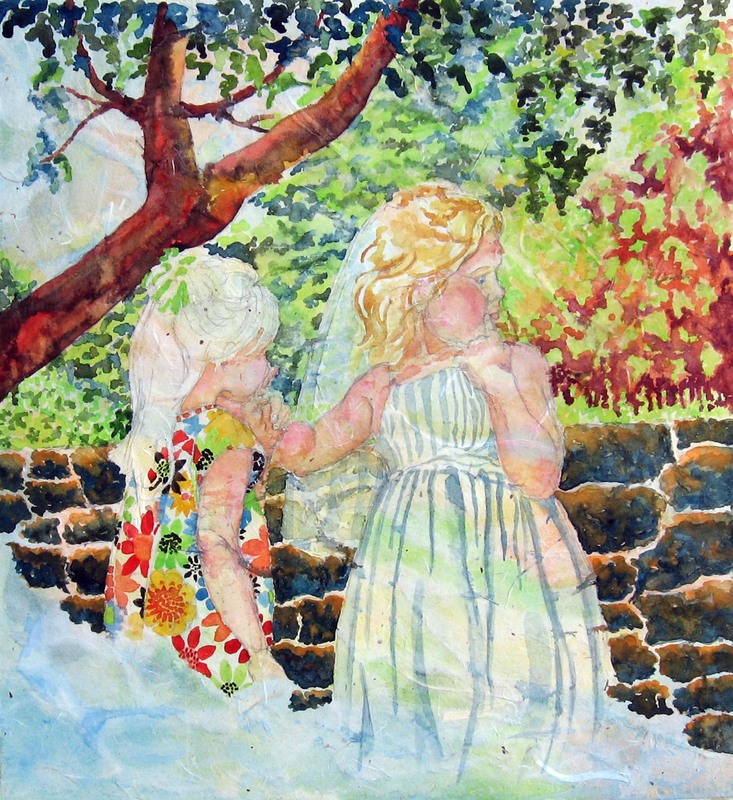 To finish the painting I added white gouache to the larger girl’s dress and veil. In the second painting I added the white gouache to leaf forms and tiny flowers. I chose to fade the bottom of both pieces to show the textures of the papers and make the paintings appear significant of a memory. I liked this technique enough to want to do more of them. 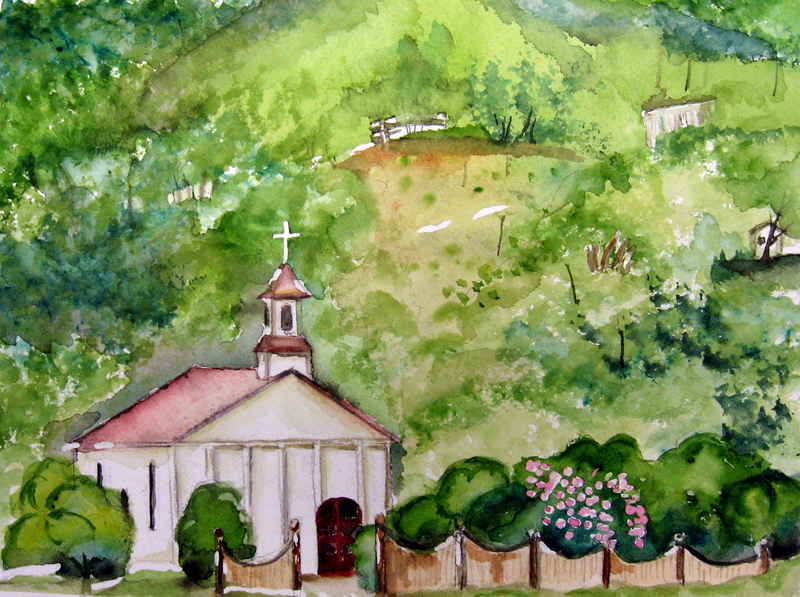 The above paintings are examples of work from the Exploring Watercolor class. This group worked on wet-in-wet, wet on dry, and dry brushing techniques. They learned to soften edges, splatter, use wax resist, saran wrap print, sponging and masking fluid. We practiced painting trees, skies, clouds, buildings and little people. They did a great job of learning to partner with water. 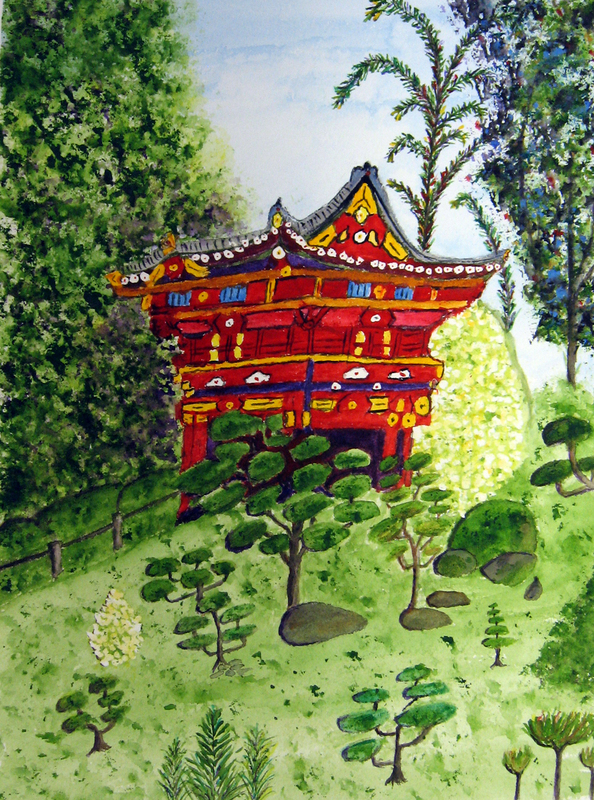 The above paintings are a result of using rice paper collage with watercolor. This class learned several different techniques with rice paper. They worked with covering a painting with textured rice paper as well as using torn or cut rice papers before painting and after painting their pieces. This is by far the most challenging class I teach. I send out a heart felt thankyou to all who participated. Thankyou, also, for sharing your work on this blog! 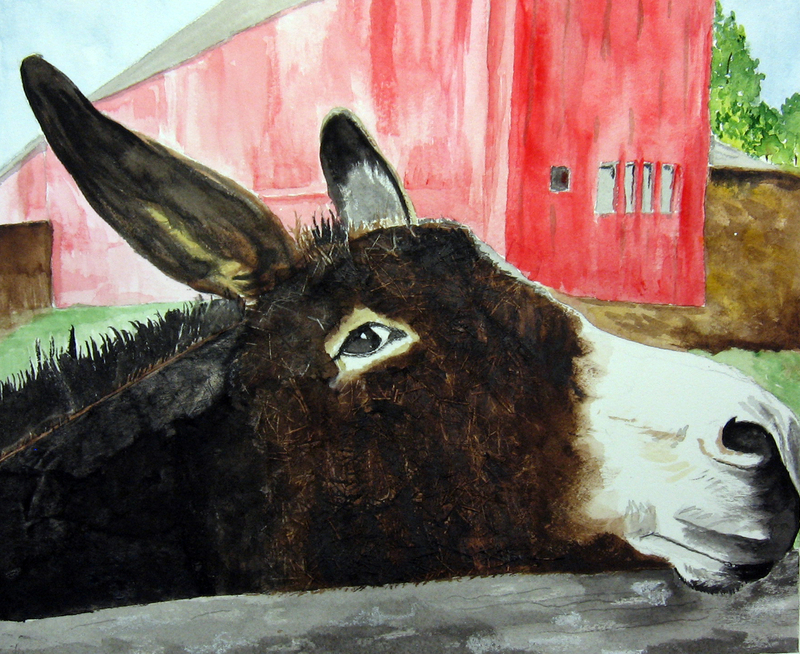 You may view the entire group of paintings in a gallery I have set up on the Student Art 1 Page found by clicking here or by clicking on the title Student Art 1 on the top of this blog. 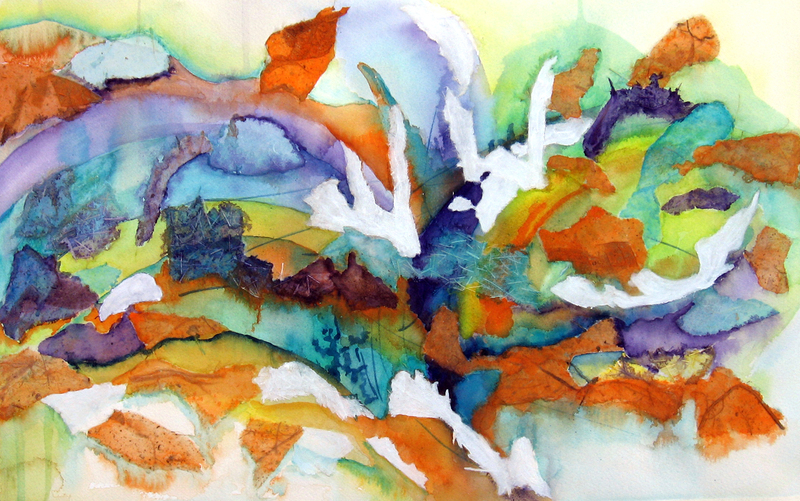 I began this painting with an abstract watercolor and rice paper collage. This would serve as my background for the painting I wanted to create. I thought this particular painting suggested an aquarium-like feeling, so I went in search of a photo reference of a fish. Thank you to Wet canvas reference library for the photo reference of the fish. I drew the fish on a large sheet of drawing paper, first. I then selected a textured and fairly transparent piece of rice paper and traced the fish drawing onto it with a black sharpie. Any kind of waterproof ink can be used for this phase. The drawing can even be transferred to the rice paper using brush and ink. 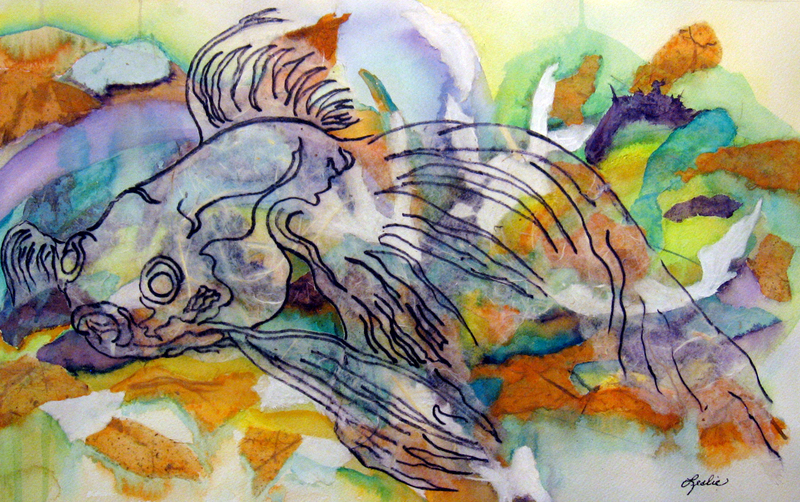 I then cut and tore my fish image from the sheet of rice paper and affixed it to the surface of my abstract painting. I used one part water to three parts acrylic matte medium to create my glue mixture. I was careful to smooth the image down to the surface of the paper with my brush, I brushed from the center of the image outward in order to get rid of any air bubbles trapped under the image. I waited for this to fully dry before proceeding. 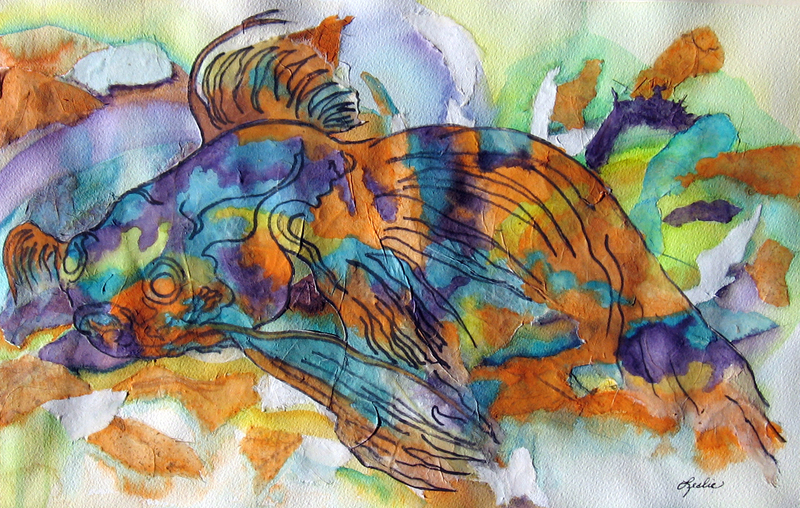 I painted many of the colors from the background through the fish rather than painting the fish to stand out from the background. It was a personal choice but brought some challenges with it by doing so. My fish appeared flat and lost in its background of colors. Had I chosen to use colors less like the background, he may have stood out better. 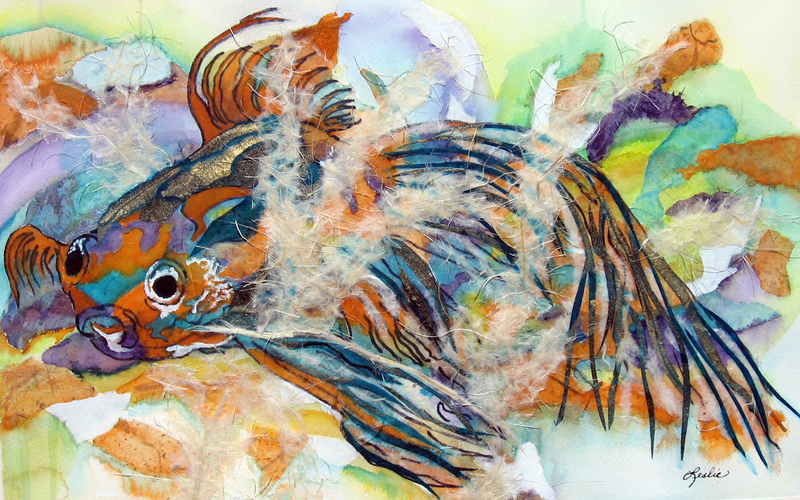 I carefully cut dark strips of rice papers for my fish’s tail and fins and glued in some colored shapes along his back. I used india ink to blacken his eyes. I used white acrylic for the gills and white around his eyes and mouth. 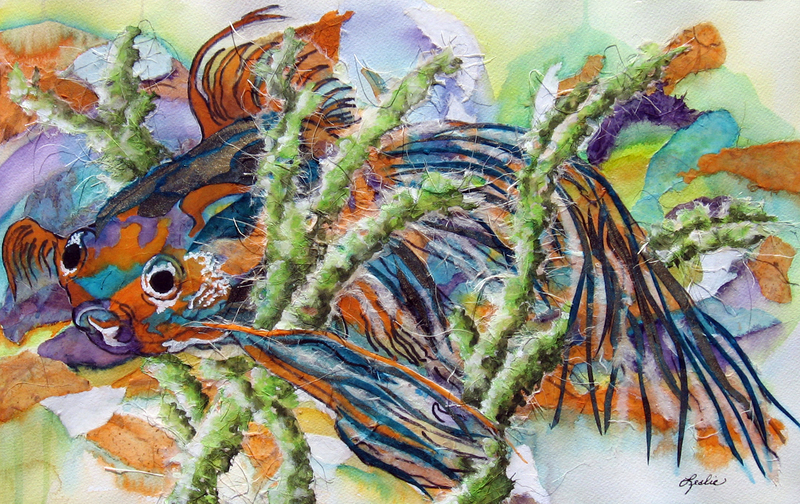 I then tore strips of textured rice paper and shaped some strands of seaweed in and around him. I hoped this would create some depth to my painting. 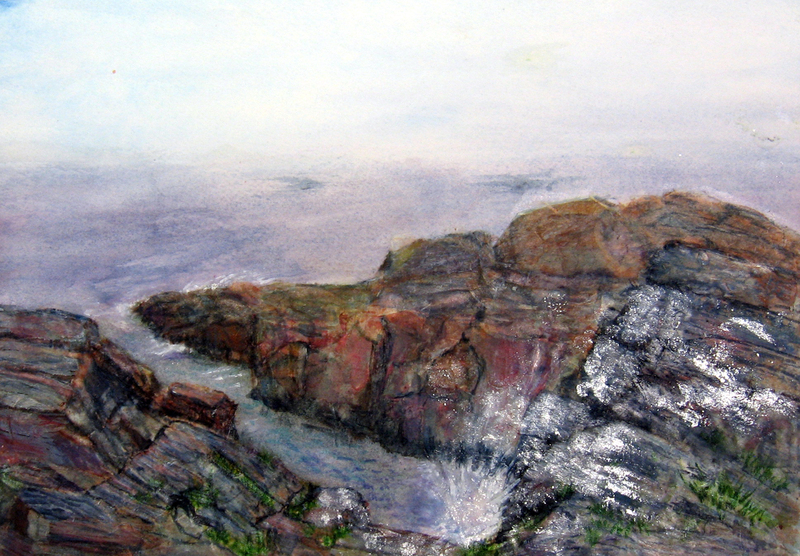 After the rice papers dried, I painted the seaweed with several shades of green watercolor and acrylic white. 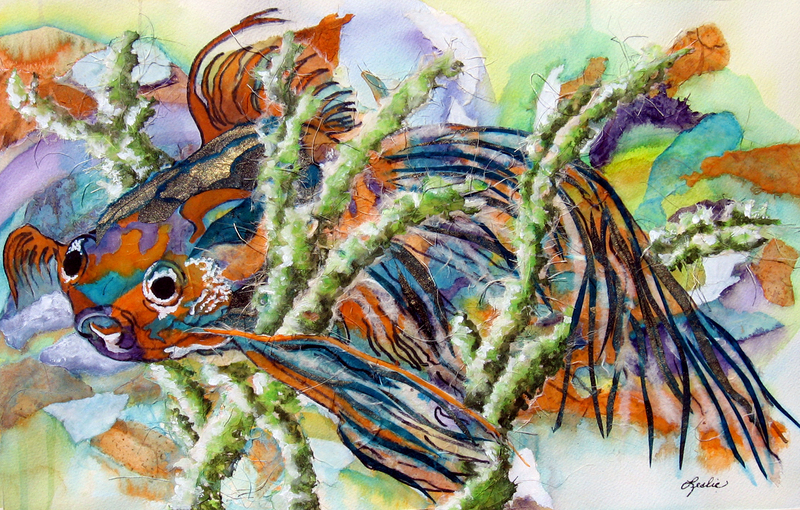 This helped to give some depth to the painting as well as help the fish to become more visible within it. The last thing I did was to push his head forward more and make it more visible by washing in acrylic white and cerulean blue washes under his chin and left side of his face. This helped to lighten the background without getting rid of the local color and shapes already there. 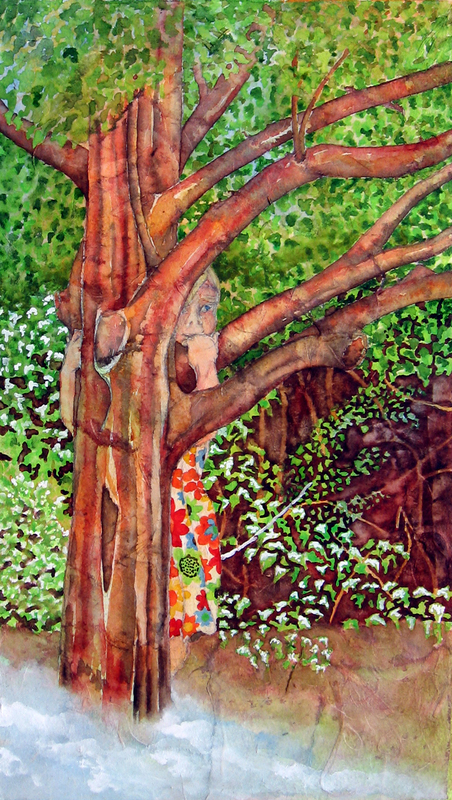 To view other rice paper paintings I have created click here. 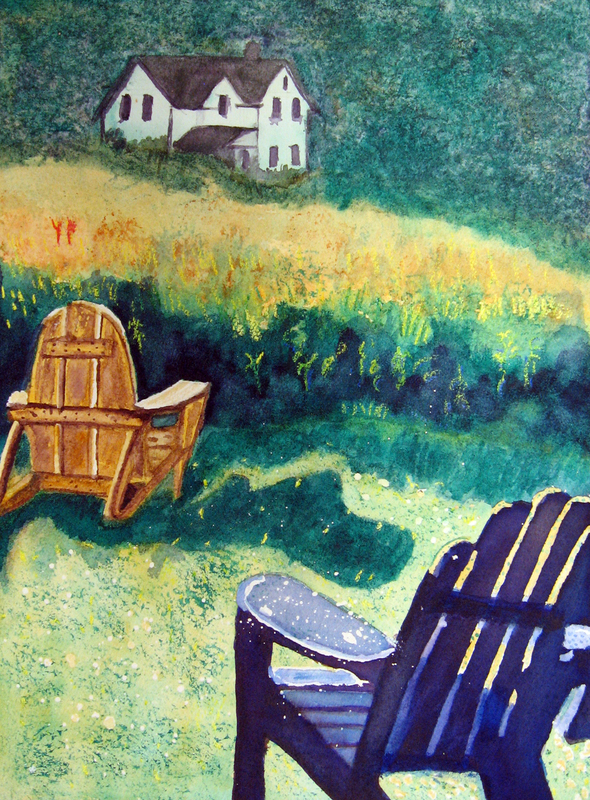 The above painting came from using rice papers on the positive shapes in a painting, to add texture. I began with a painting and blocked in all the forms I wanted to include, Much like how I began the painting in the previous post. 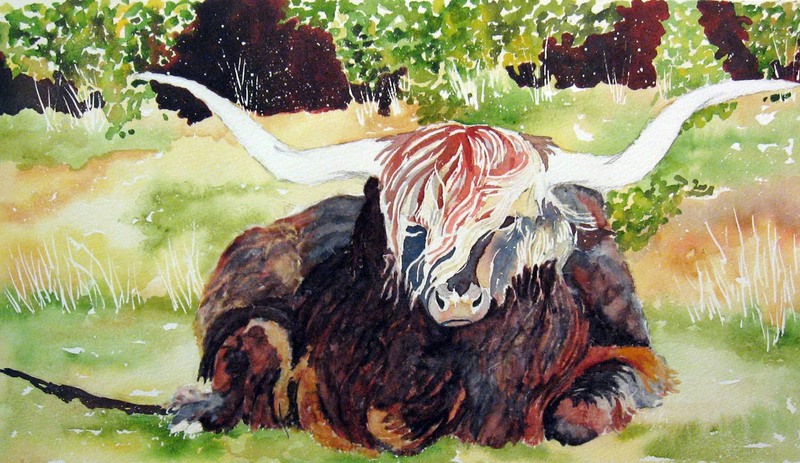 I covered the bull in torn strips of textured rice paper, working from bottom to top so the pieces would overlap like the hair on the bull would. I painted the coat following the values I saw in the reference photo. Thank you to Wet Canvas for the reference. 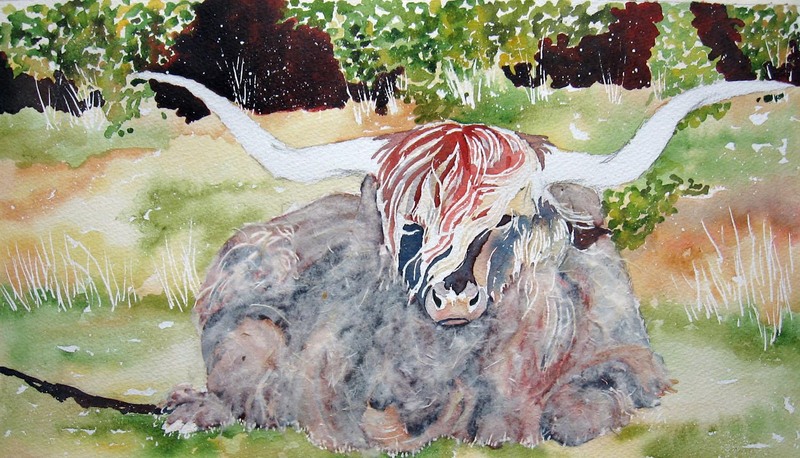 To finish the bull, I glued more torn strips of rice papers on the head and painted them. I painted the light washes on the horns. 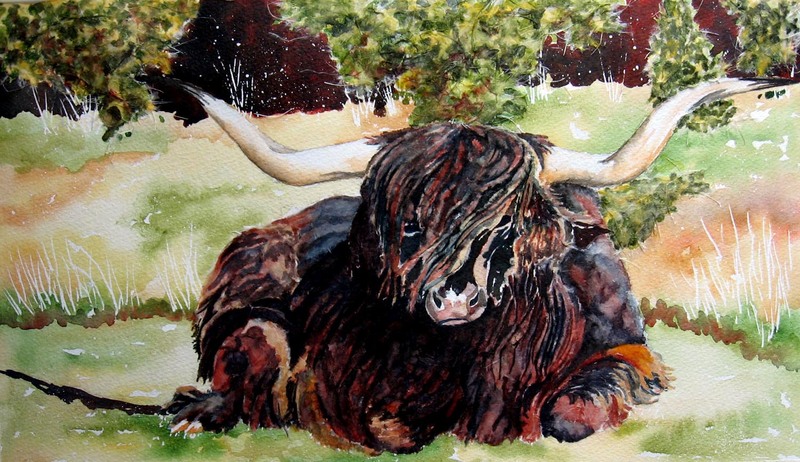 I glued rice papers on the clumps of foliage behind and to one side of the bull for balance. 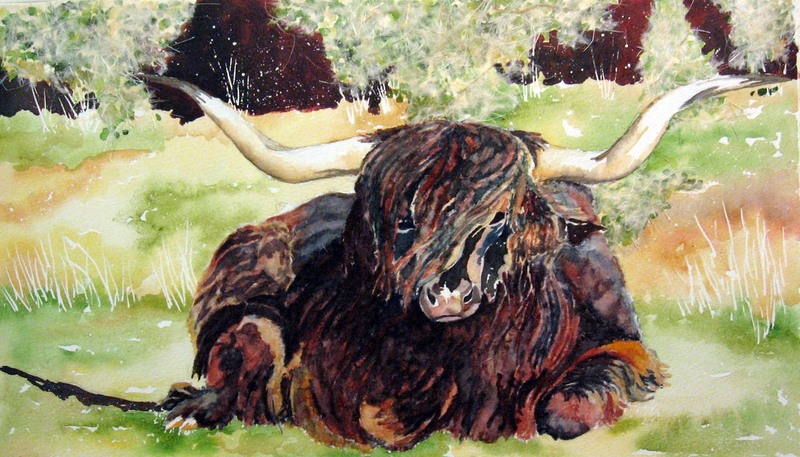 I finished the painting by painting the rice paper foliage and using india ink in the hair fibers and shadows on the bull. 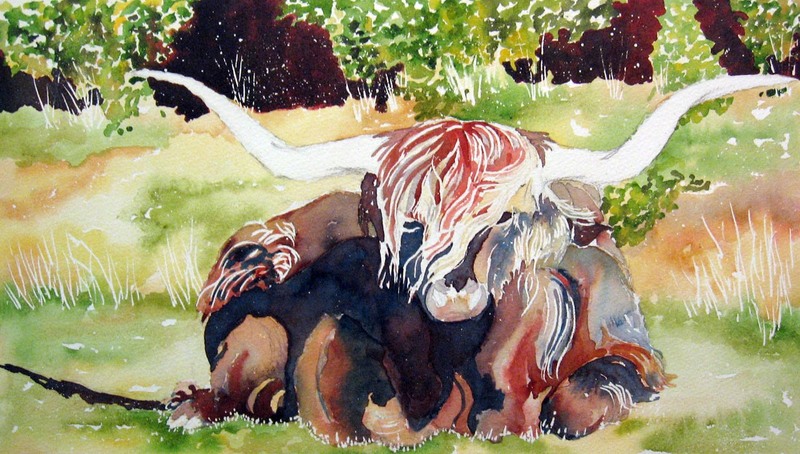 This is a fairly long process because the artist works in steps and gives ample time for each step to dry in between. I liked this and will use it in future paintings where I want to increase texture. 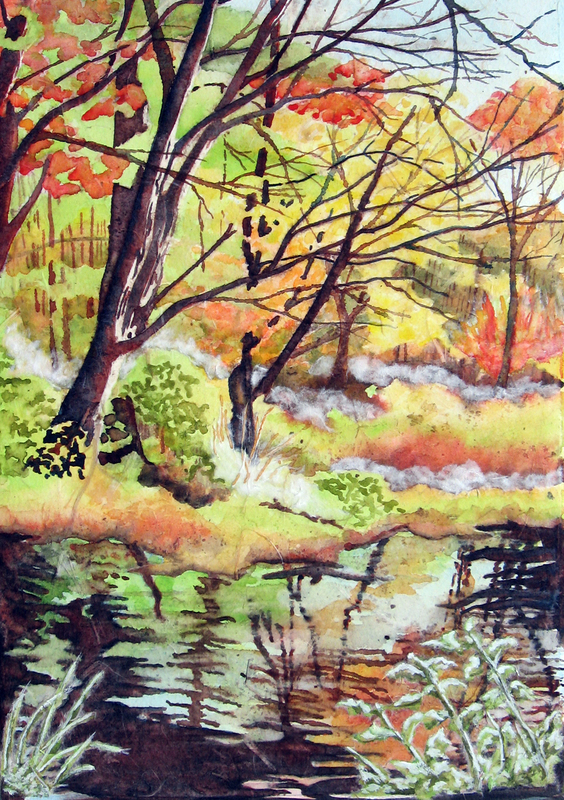 The above painting is another technique I tried with watercolor and rice paper. 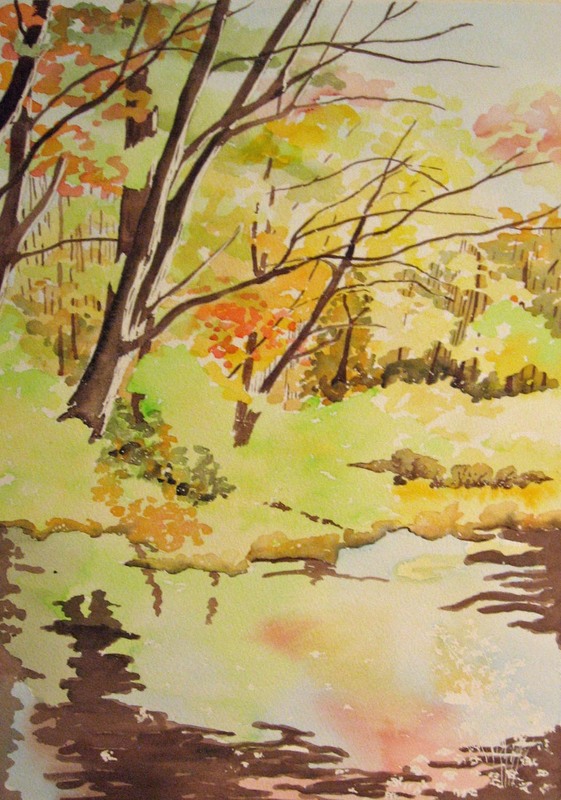 I began by painting the landscape you see, above, on 140lb Rough Arches Watercolor Paper. 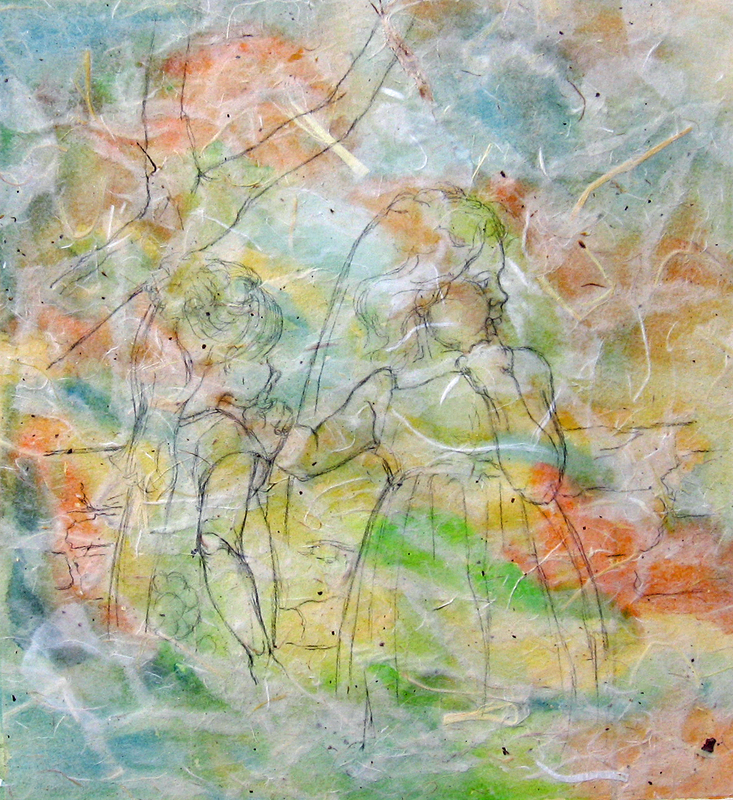 I chose a piece of textured and mostly transparent rice paper, measured it to the size of my painting and glued it on top of the painting. I mixed one part water with three parts acrylic matte medium and applied it to the back of the rice paper and carefully laid it over the surface of my incomplete painting. I used a large flat brush with soft bristles to apply thin layers of the glue mixture to the surface and gently push air bubbles out. A roller can also be used for this step. Handle the wet rice paper gently because it becomes very fragile when it is wet. The watercolor paper ripples and my rice paper lifted up when it did that. I solved that by reflattening the rice paper with my brush and drying areas with a hair dryer as I did that. I allowed this phase to dry overnight. Then the work began. I repainted the original scene through the paper and added more colors as well as pushed my darks and detail. 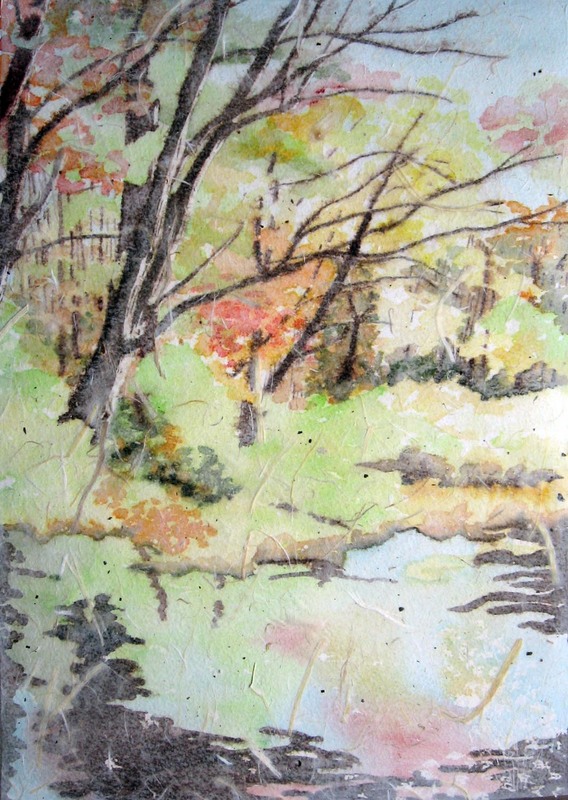 I added foreground rice paper shapes and more rice papers to the middle ground, playing with value and texture. The painting, above, is what I came up with. 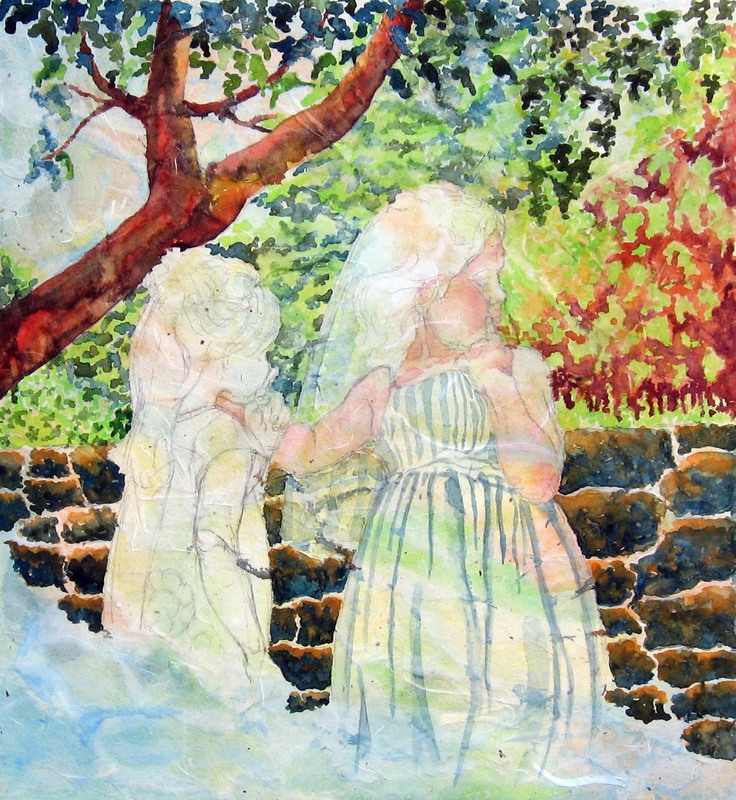 You can also re-work a failed watercolor painting this way. It is very time consuming, so be prepared for that. I am going to be on the lookout for interesting textures in rice papers to experiment furthur with this technique.